5G (5th-generation) wireless communication, expected to hit the market by 2020, is the next mobile technology standard – delivering high data rate, low latency communications, and massive device connectivity. 5G is a broad market, and its deployment requires the development of many technology blocks. Indeed, 5G will affect global telecommunication services such as mobile phones, IoT (internet of things), vehicles, and more. Along with mobile devices, 5G and 5G-related networks require the deployment of new infrastructures supporting specific protocols and operation modes, such as multi-input multi-output (MIMO), massive MIMO, beamforming, beam steering, carrier aggregation, and others. In addition to increase the data rate and bandwidth, 5G devices must be compatible with many data types. 5G players must explore new frequency spectrums and more – especially the millimeter wave frequencies (from 20 GHz – 300 GHz). Among all RF components now in development for 5G applications (filters, power amplifiers, RF front-end modules, etc. ), the antenna has become a very complex, invaluable segment of the 5G network. It was only in 2014 that the term “5G” began appearing in patents. 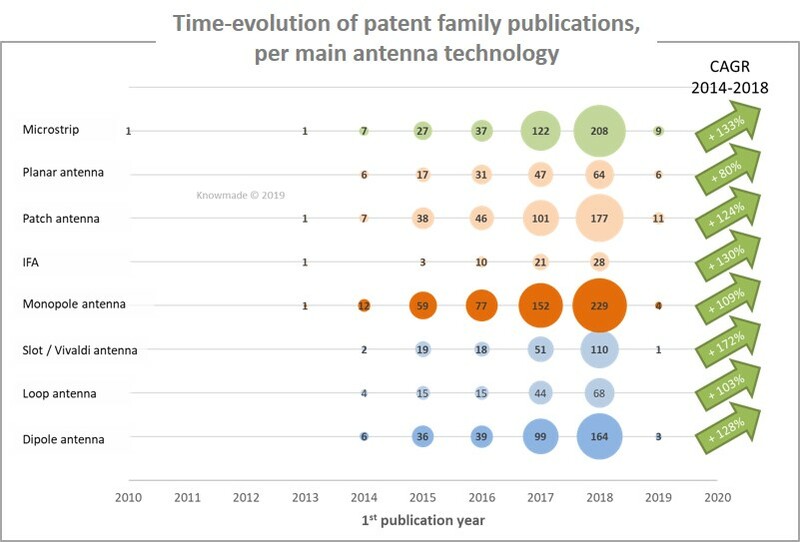 Since then, the number of 5G-related patent publications has seen a huge increase, with a growth rate of 113% from 2014 – 2018. This strong acceleration is pushed mostly by Chinese IP players, which account for more than 56% of IP activity. In particular, we have noticed a large number of Chinese academic players, which is quite unusual in the telecom domain. Today, the IP landscape related to antenna for 5G is still unsettled. With more than 75% of patent applications still pending, much will change in the coming years. Indeed, after an initial period of domestic patent applications, the main IP and market players – i.e. Samsung, Intel, Ericsson, and Huawei – have begun extending their portfolios worldwide. Samsung and Intel appear to be the two leaders currently best-positioned to limit their main competitors’ patenting activity and freedom-to-operate. In this report, Knowmade has manually segmented the patent corpus in terms of applications. The analysis shows that after a dominant period by US and European IP players involved in the development of antenna for infrastructures and networks, the IP activity related to antenna for handsets has started accelerating. Pushed by the strong patenting activity of Chinese giants Oppo Mobile and Huawei, the IP segment related to handsets is strengthening and will continue growing in importance, thanks to the filing of a number of promising patents related to antenna for handset. We have observed significant IP activity related to monopole and microstrip antenna. This IP dynamic confirms the growing interest in low-profile, small-size, low-cost antenna, which are oft-used in handsets. Furthermore, our report details recent developments and trends that attest to the growing interest in patch antennas, which appear to be the preferred solution for addressing 5G’s technical challenges. 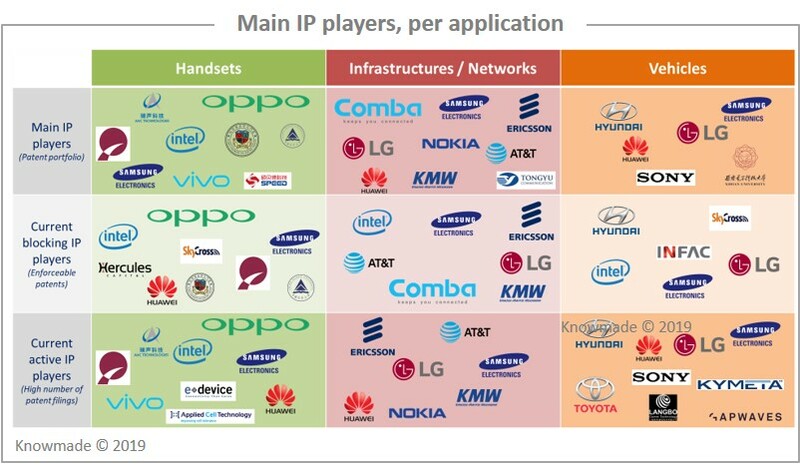 Indeed, the main IP and market players (Apple, Samsung, Huawei, etc.) have commenced development of IP activity related to patch-antenna array. More than 620 patent applicants are involved in the antenna for 5G patent landscape. 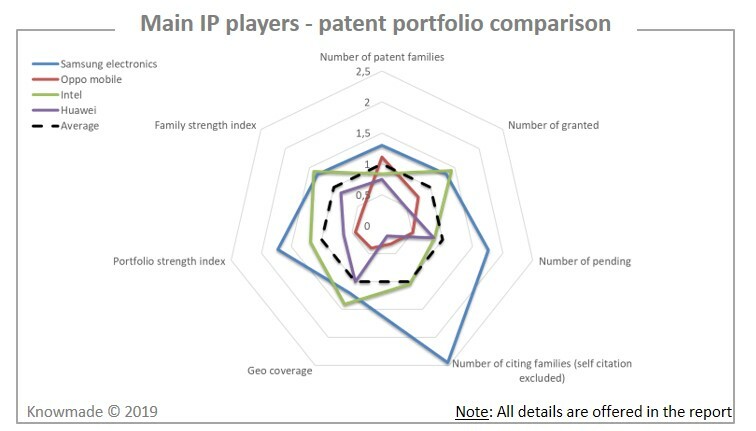 This report reveals the key players’ IP position through a detailed analysis of their patent portfolios. Knowmade also provides an understanding of these players’ patented technologies and their IP strategy, and explores their capability to limit other firms’ patenting activity and freedom-to-operate. A thorough analysis of key patents (seminal, blocking) related to antenna for 5G is included in this report. Furthermore, for each segment a selection of seminal, blocking, and most-promising patents is furnished. SAMSUNG ELECTRONICS, OPPO MOBILE, INTEL, AAC TECHNOLOGIES, HUAWEI TECHNOLOGIES, SHENZHEN SUNWAY COMMUNICATION, AT&T, LG, GUANGDONG TONGYU COMMUNICATION, SOUTH CHINA UNIVERSITY OF TECHNOLOGY, ERICSSON, XIDIAN UNIVERSITY, XIAMEN UNIVERSITY, TAN KAH KEE COLLEGE, CHIUN MAI COMMUNICATION SYSTEMS, SOUTHEAST UNIVERSITY NANJING, NOKIA, COMBA TELECOM SYSTEMS, UNIVERSITY OF ELECTRONIC SCIENCE & TECHNOLOGY OF CHINA, KUANG CHI INSTITUTE OF ADVANCED TECHNOLOGY, SHANGHAI AMPHENOL AIRWAVE COMMUNICATION ELECTRONICS, MURATA MANUFACTURING, QUALCOMM, KUNSHAN RUIXIANG XUNTONG COMMUNICATION TECHNOLOGY CO, SONY, ELECTRONICS & TELECOMMUNICATIONS RESEARCH INSTITUTE, ZTE, CHINA JILIANG UNIVERSITY, HUIZHOU SPEED WIRELESS TECHNOLOGY, VIVO MOBILE COMMUNICATION, and more.